The Northrop Grumman E-8 Joint Surveillance Target Attack Radar System (Joint STARS) is a United States Air Force battle management and command and control aircraft. It tracks ground vehicles and some aircraft, collects imagery, and relays tactical pictures to ground and air theater commanders. The aircraft is operated by both active duty Air Force and Air National Guard units and also carries specially trained U.S. Army as additional flight crew. The E-8C is an aircraft modified from the Boeing 707-300 series commercial airliner. The E-8 carries specialized radar, communications, operations and control subsystems. The most prominent external feature is the 40 ft (12 m) canoe-shaped radome under the forward fuselage that houses the 24 ft (7.3 m) side-looking APY-7 phased array antenna. The E-8C can respond quickly and effectively to support worldwide military contingency operations. It is a jam-resistant system capable of operating while experiencing heavy electronic countermeasures. The E-8C can fly a mission profile for 9 hours without refueling. Its range and on-station time can be substantially increased through in-flight refueling. The AN/APY-7 radar can operate in wide area surveillance, ground moving target indicator (GMTI), fixed target indicator (FTI) target classification, and synthetic aperture radar (SAR) modes. To pick up moving targets, the radar looks at the Doppler frequency shift of the returned signal. It can look from a long range, which the military refers to as a high standoff capability. The antenna can be tilted to either side of the aircraft for a 120-degree field of view covering nearly 50,000 km² (19,305 mile²) and can simultaneously track 600 targets at more than 250 km (152 miles). The GMTI modes cannot pick up objects that are too small, insufficiently dense, or stationary. Data processing allows the APY-7 to differentiate between armored vehicles (tracked tanks) and trucks, allowing targeting personnel to better select the appropriate ordnance for various targets. The system's SAR modes can produce images of stationary objects. Objects with many angles (for example, the interior of a pick-up bed) will give a much better radar signature, or specular return. In addition to being able to detect, locate and track large numbers of ground vehicles, the radar has a limited capability to detect helicopters, rotating antennas and low, slow-moving fixed-wing aircraft. The radar and computer subsystems on the E-8C can gather and display broad and detailed battlefield information. Data is collected as events occur. This includes position and tracking information on enemy and friendly ground forces. 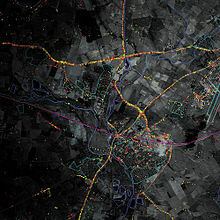 The information is relayed in near-real time to the US Army's common ground stations via the secure jam-resistant surveillance and control data link (SCDL) and to other ground C4I nodes beyond line-of-sight via ultra high frequency satellite communications. Other major E-8C prime mission equipment are the communications/datalink (COMM/DLX) and operations and control (O&C)subsystems. Eighteen operator workstations display computer-processed data in graphic and tabular format on video screens. Operators and technicians perform battle management, surveillance, weapons, intelligence, communications and maintenance functions. Northrop Grumman has tested the installation of a MS-177 camera on an E-8C to provide real time visual target confirmation. In missions from peacekeeping operations to major theater war, the E-8C can provide targeting data and intelligence for attack aviation, naval surface fire, field artillery and friendly maneuver forces. The information helps air and land commanders to control the battlespace. The E-8's ground-moving radar can tell approximate number of vehicles, location, speed, and direction of travel. It cannot identify exactly what type of vehicle a target is, tell what equipment it has, or discern whether it is friendly, hostile, or a bystander, so commanders often crosscheck the JSTARS data against other sources. In the Army, JSTARS data is analyzed in and disseminated from a Ground Station Module (GSM).